The Fitting Room is a trading name of sole trader Clare Glenister who is the Data Controller for this small, independant business. We are committed to protecting your privacy and maintaining the security of any personal information (personal data) received from you. We strictly adhere to the requirements of the EU General Data Protection Regulation 2016/679 (GDPR). If you visit us and make a purchase in store, this purchase information will be stored within our database to enable us to comply with taxation laws. The order will be processed using the Data Processing Procedure set out below. In this instance we will seek your permission to use your email address, name and telephone number for our records. If you require the item to be posted your address will also be required. If you supply us with an email address you will receive an email outlining the details of the order you have placed. Upon request we are able to provide you with your size and past purchase history should you require it. You are not obliged to set up an account. Should someone ask for this information to enable them to purchase a gift for you we will only give them the style number and size from a past order to help them make a purchase, no other personal information will be disclosed. If you place an order in our store for items not in stock today (special order) your information will be stored within an encrypted and password protected spreadsheet, this information will be deleted when your order has arrived at our store and it has been processed, collected and paid for. When you place a special order we will require your telephone number so we can contact you to let you know that the order has arrived with us. Name, Billing Address, Email Address, Telephone Number and, if applicable, your Company Name, Shipping Adress and VAT Registration Number. We use the personal data collected to notify you of your purchase and to communicate with you in connection with all matters relating directly to the order you have placed. It is your responsibility to ensure that the personal data provided to us is accurate and up to date. You can update your personal contact details, including email address and phone number, by visiting your account online or contacting us by email or telephone. You can ask us what personal data we hold on you at any time, free of charge. In order to maintain the accuracy of the data, you can check, update, amend, or remove personal data by logging into your Account. You can also contact us directly - please see below. All website purchases take place in a safe environment using the latest security technology to protect our customers. We encrypt yourpersonal information to ensure your transactions with us are private and protected. We accept orders only from web browsers that permit communication through Secure Socket Layer (SSL) technology and can be identified by the green padlock in your browser. This encryption makes it virtually impossible for unauthorised parties to read any information that you send us. PayPal is a fast and convenient way of transacting online without the need to input payment details. We share your name, email, shipping address and basket details securely with PayPal to process your order. With regards to your personal data used in PayPal transactions, both PayPal and Clare Glenister are each respectively a data controller. This means that we each, independently maintain privacy policies, notices and procedures governing our use of your personal data. We will use your personal contact details such as name, postal address, phone number and email address that you provide to us in respect of delivering products or services to you. We will share this information with our delivery partners who may contact you to arrange a convenient delivery time and provide you with updates as to when the order will arrive. 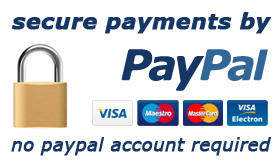 We use your customer account and contact details to verify any returns and refunds that we process by Paypal. Who is able to access my information? Under the GDPR, transfers of personal data outside the EEA are restricted unless the receiving entity has obtained an "adequacy decision" from the EU Commission or there is a valid data transfer mechanism in place. Passwords are encrypted and may be automatically generated by our system. We recommend that you use strong Passwords to access your account and that you change them regularly. We use Bluepark to maintain all of our ecommerce business. The data held by us is stored on servers located within the RapidSwitch facility in Maidenhead, Berkshire. RapidSwitch is one of the UK's leading server hosting providers and is recognised as one of the longest established in the UK. It is part of the AIM-listed Iomart Group PLC, with fully owned world class resilient infrastructure end to end. It is ISO 27001 and 9001 accredited. It has multiple levels of security and staff on-site 24x7x365. We do not send out specific marketing materials via Social Media platforms. If you no longer want to see information from The Fitting Room on your pages, you have the option to unsubscribe or hide all further communications from us. If you have a registered account with us, you can update and change your marketing preferences at any time by going to your account and changing your preferences. Alternatively, simply send us an email and we will change your marketing preferences. Please note that it may take up to 48 hours for all our systems to process and update your emails marketing preference changes. Profiling is a term used to describe a form of data processing where significant volumes of data made up of lots of different data types – such as browser history from Cookies, age, gender, size, transaction history, demographics and buying habits – we do not use any form of profiling on our website. If you have any complaints, please contact us by email or telephone so we can deal with your complaint as quickly as possible. We will need to access your personal data and account history to verify your identity for security reasons and deal with the details of your complaint. Details of any complaints received will be logged and recorded so they can be dealt with accordingly. You have the right to request your personal data to be permanently deleted from our records and systems to avoid any further communication with you. Your request will always be considered in light of the legal bases that we hold, store and process your personal data and the purpose that we collected your data. Where the legal bases permits, we will carry out your instruction without undue delay. Please note, however, that where we have a legal or contractual obligation to hold your personal data, we may not be able to carry out your request but we will explain this fully to you. Please address any request to delete your data by email or using the contact us page. Should you believe that we are processing your personal data in a way that you did not understand or agree to and wish to restrict such processing, please email us or use the contact us page.